Winston Graham, perhaps best known for his historical novels featuring ex-Revolutionary War soldier Ross Poldark (adapted by the BBC and starring Robin Ellis) and suspense novel Marnie (1961; adapted by Hitchcock), was born today in Manchester in 1908. His many works include Night Journey: An Adventure (1941), Take My Life (1947), Fortune Is a Woman (1953), and After the Act (1965). He died in 2003. Conan Doyle-as-writer exhibition, Westminster Libraries. The Westminster Libraries in London offers the online exhibition "Arthur Conan Doyle: The Prolific Writer," which seeks to highlight Conan Doyle's work outside of the Sherlock Holmes canon, such as fiction works featuring Professor Challenger, nonfiction on spiritualism and the Boer War, and accounts of his investigations into real-life crimes. About the photo: Arthur Conan Doyle, date unknown. Library of Congress, Prints and Photographs Division. BBC Radio 7 follows up last week's broadcast of John Buchan's The Thirty-Nine Steps with another Richard Hannay adventure, The Three Hostages, as well as Sick Heart River, which was the farewell appearance of Buchan's other series character, lawyer Edward Leithen. Go here for the schedule or to listen. Valancourt Books has just reissued Florence Marryat's Blood of the Vampire (1897, published the same year as Bram Stoker's Dracula). It features Harriet Brandt, "daughter of a mad scientist and a voodoo priestess," who seems to have a curiously lethal effect on those around her. Actress, operatic singer, playwright, and spiritualist Marryat (1837–99) produced more than 50 books over the course of her lifetime. About the image: A rendering of Florence Marryat from her acting days. New York Public Library. The Victorian Women Explorers exhibition at UK's National Portrait Gallery includes an image of novelist and Egypt Exploration Fund cofounder Amelia B. Edwards, who was one inspiration for Elizabeth Peters's Amelia Peabody Emerson. Edwards also wrote ghost stories; for some examples, go here. Professional cynic, Civil War veteran, and prolific writer Ambrose Bierce—best known for the Devil's Dictionary with its unique definitions ("SENATE, n. A body of elderly gentlemen charged with high duties and misdemeanors") and the famous twist ending of "An Occurrence at Owl Creek Bridge" (1890)—was born today in Ohio in 1842. He disappeared under mysterious circumstances in 1913 while attempting to locate Mexican bandit Pancho Villa. Gregory Peck played Bierce in Old Gringo (1989). About the photo: Ambrose Bierce, date unknown. Library of Congress, Prints and Photographs Division. Donna Leon on WABE's Between the Lines. On the June 12th program of WABE's Between the Lines, Donna Leon talked about her new novel About Face with Commissario Guido Brunetti. This week on BBC Radio 7, mining engineer Richard Hannay attempts to thwart enemy spies in John Buchan's classic The Thirty-Nine Steps; also featured is Buchan's Huntingtower and Walter Mosley's Devil in a Blue Dress. Go here for the schedule or to listen. 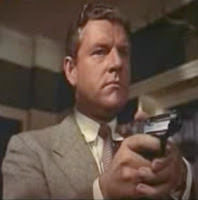 About the image: Kenneth More as Richard Hannay in The 39 Steps (dir. Ralph Thomas, 1959). Following up its reprints of the original Nancy Drew and Hardy Boys titles, Applewood Books has reissued several novels in the Judy Bolton series by Margaret Sutton (aka Rachel Irene Beebe, 1903–2001). These include The Vanishing Shadow (orig. publ. 1932), The Haunted Attic (orig. publ. 1932), The Invisible Chimes (orig. publ. 1932), Seven Strange Clues (orig. publ. 1932), The Ghost Parade (orig. publ. 1933), and Clue of the Stone Lantern (orig. publ. 1950). A discussion of the work of Richard Peck. On Radio New Zealand, Kate De Goldi discusses the novels of Edgar winner Richard Peck. Parisian commemorations for Oscar Wilde. The Bunburyist must note what D. C. Rose, president of the Societe Oscar Wilde en France, has advised: The Paris City Council will soon be naming a street or square after Wilde in response to a poll. Rose also notes that the society is organizing a ceremony on July 19 to mark the centenary of the transfer of Wilde's remains to Pere Lachaise Cemetery. About the photo: Oscar Wilde, ca. 1882. Library of Congress, Prints and Photographs Division. CBC's Between the Covers features readings of Howard Engel's mystery The Memory Book with PI Benny Cooperman (based on Engel's real-life experience with stroke, when he found he could write but not read). There was a fine tribute to the Welsh-born actor-producer Sir Stanley Baker (1928–76) on the BBC's Film Programme, including his roles in Zulu (1964), The Cruel Sea (1953), and The Guns of Navarone (1961), as well as in crime films such as The Criminal (1960), Robbery (dir. 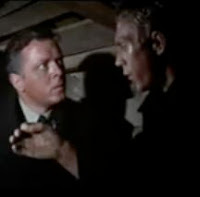 Peter Yates, 1967), and early police proceduralist Maurice Procter's Hell Is a City (book 1954; film 1960). This week on BBC Radio 7, Nicolas Freeling's Inspector Van der Valk appears in Love in Amsterdam; also featured are short stories by thriller master Edgar Wallace, including "The Mind of Mr. J. G. Reeder." Go here for the schedule. Red Harvest reaps at auction. At the Bonhams June 10th auction of fine books and manuscripts, a 1929 first edition of Dashiell Hammett's Continental Op book Red Harvest—estimated at $5000—went for $27,450. BTW, at this panel with Hammett biographer Richard Layman and others, you can learn why there is no film version of Red Harvest. Brian Garfield at Alaska Book Festival. Brian Garfield, best known for novels such as Death Wish and Hopscotch, appears at this weekend's Alaska Book Festival in Fairbanks to discuss screenwriting (today) and The Thousand-Mile War, his book on the Aleutian campaign during World War II (tomorrow). Go here for the festival schedule. I'm a big fan of the collection Garfield edited for MWA—I, Witness—which recounts personal encounters of MWA members with crime. Detection Club member Dorothy Bowers was born today in Herefordshire in 1902. Her works—most featuring Scotland Yard Chief Inspector Dan Pardoe—include Postscript to Poison (1938), Shadows Before (1939), Deed without a Name (1940), Fear and Miss Betony (1941), and The Bells of Old Bailey (1947). She died of tuberculosis in 1948. "I don't expect to come to New York to 'deal with the publisher.' The only way to deal with him would be to shoot him, and I don't want to spare the ammunition." —E. B. White to Harriet Walden, 3 September 1971, Letters of E. B. White 574 (White was in the midst of revising Strunk and White's The Elements of Style). Vintage newspaper search at LOC. As the Library of Congress noted on its blog, it is working on a better online interface to search selected newspapers from 1880—1910. At left is one result: an August 26, 1906, ad from the New York Tribune for a serialization of Jacques Futrelle's The Thinking Machine (Futrelle died on the Titanic in 1912). Time magazine is asking readers to submit questions for Stephanie Plum creator Janet Evanovich for an interview slated for an upcoming issue. Sister Carol Anne O'Marie, 1933–2009. Janet Rudolph announced the sad news of the May 27th death of Sister Carol Anne O'Marie, creator of the Sister Mary Helen mysteries. I remember her once telling me she wrote her novels for relaxation—a diversion from the hard realities that she saw in her day-to-day work. Another of my cherished memories is attending a luncheon during one Bouchercon. I was sitting at a table with Sister Carol Anne and Gar Anthony Haywood, as Gar—who had served on a panel with Sister Carol Anne and is himself no mean man with a quip—told her, "Sister, you are a riot." Donations in Sister's memory may be made to the homeless shelter she cofounded, A Friendly Place, 2298 San Pablo Ave., Oakland, CA 94612, or to her order, Sisters of St. Joseph of Carondelet, 11999 Chalon Rd., Los Angeles, CA 90049. On the Fine Books blog, Stephen J. Gertz takes this amusing look at advertisements that appeared in Dickens's serialized works, such as one that appears to be for an early mimeograph: "Lookout, Xerox! Twenty pages a minute! Blazing speed!" Lisa Rosner, author of The Anatomy Murders (due out in October), has developed an online slideshow dealing with the nineteenth-century Edinburgh murderers William Burke and William Hare. Rosner discusses the Web site and her book here. (Hat tip to the AHA blog). The recent Guardian podcast with P. D. James on her novel The Lighthouse contains the reminder that she, a huge Jane Austen fan, once wrote a discussion of Emma as detective story. See the appendix of James's autobiography Time to Be in Earnest. Alas, Emma Woodhouse is not a great detective—she fails to see the clues right in front of her regarding her closest relationships. James states during the podcast that Austen would have made a fine mystery writer. US comics corrupt innocent British youth. I was vastly entertained by this podcast from the National Archives UK, "Kapow! Fifties Britain versus the Comics Menace," which discusses the great fear that we degenerate Yanks were corrupting the innocent youth of Britain with our comic books in the 1940s and 1950s. In reality, as the presenter shows, there was a substantial comics tradition in the UK well before our materials reached its shores. Interesting as well was the statement that in Britain, there was a concerted effort to destroy any copies of Mickey Spillane's I, the Jury that cropped up. Also fascinating: this National Archives UK podcast on the real story behind the film The Great Escape, which discusses the breakout at Stalag Luft III, the deliberately planned murders of 50 escaping POWs, and the war crimes trials that occurred afterward. More John Buchan this week on BBC Radio 7.